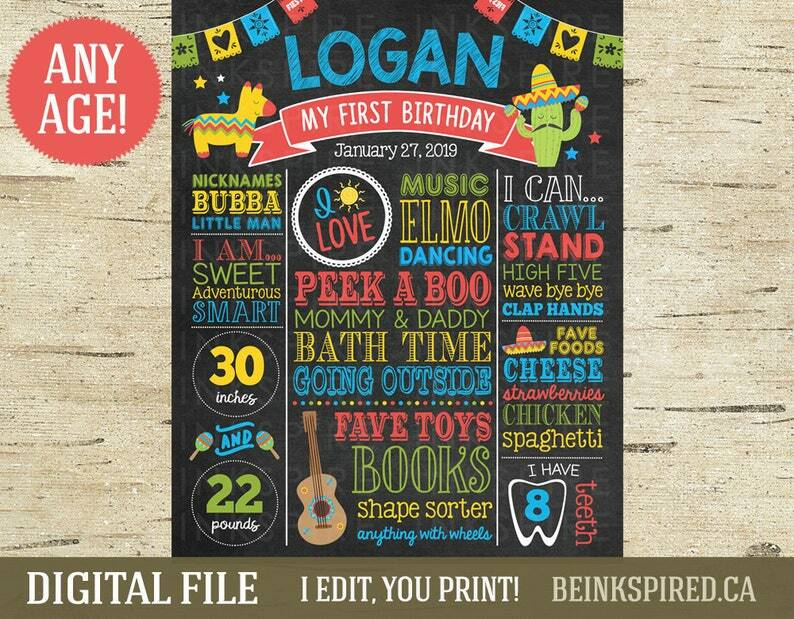 Commemorate your child's major milestones and favorites on his/her birthday with this customizable sign. I EDIT, YOU PRINT! Perfect to display at your child's FIESTA party or as a prop for birthday photos! ** Any of the sections can be swapped out for another AS LONG AS the size remains the same. For instance, instead of "FAVE TOYS", you could put "FAVE BOOKS" with 3-4 listed underneath. Construction Birthday Board - Printable DIGITAL FILE - Personalized Construction Birthday Chalkboard - Any Age! Change the Sections! Unicorn Birthday Board - Printable DIGITAL FILE - Personalized Rainbow Birthday Party Chalkboard Sign - Any Age! Change the Sections! Wild One Birthday Board - Printable DIGITAL FILE - Pink, Mint & Gold Glitter Tribal Birthday Chalkboard Sign - Any Age! Change the Sections! Fishing Birthday Chalkboard - Printable DIGITAL FILE - Fish First Birthday Board - Any Age! Change the Sections!